1835 Hall Map of Nubia and Abyssinia (Sudan and Ethiopia). WE SELL ONLY ORIGINAL ANTIQUE MAPS - NOT REPRODUCTIONS JOIN OUR WEEKLY MAILING LIST FOR NEWEST STOCK. Description: This is a beautiful map of Nubia and Abyssinia (Ethiopia) from Sidney Hall's extremely scarce 1835 New General Atlas. It covers from Darfur east through Kaffa (a Christian State) to the Sea of Bab el Mandeb (Gulf of Aden) and from the Desert of Chebba south through the'Dominons of a Princes called Ibbe' to Donga. It includes the modern day countries of Sudan, Ethiopia, and Eretria as well as parts of Djibouti, Kenya, Egypt, Yemen and Saudi Arabia. Hall's map also includes details the politically and socially volatile regions of Darfur (Darfour) and Kordofan in modern day Sudan. This map is centered on the southern reaches of the Nile River. It shows the division of the Nile in modern day Sudan between the White Nile, which flows slightly westward toward Lake Victoria and the Blue Nile which flows slightly eastward to Lake Tana. The Blue Nile had, by this time, been traced to its source, Lake Tana (Tzana or Dembea), in the relatively well mapped Christian kingdom of Abyssinia. The White Nile is shown originating from the Donga Mountains in the extreme lower left quadrants of this map. It is a curious decision on the part of Hall to identify the Donga Mountains as a source of the White Nile, but abandon the associated lake theory that ultimately proved to have some relation to reality. The important caravan route of Sudan to Mecca is noted along with routes of several explorers in the region, including Browne 1796, Poncet 1698, and Bruce 1772, among others. During the time this map was prepared, Muhammad Ali, the Ottoman commander who was named viceroy of Egypt established the Mamluk dynasty that would rule Egypt until the Egyptian Revolution of 1952. Between 1820 and 1833, Ali annexed northern Sudan, Syria and parts of Arabia into the Mamluk Empire. Sidney Hall's New General Atlas was published from 1830 to 1857, the first edition being the most common, with all subsequent editions appearing only rarely. Most of the maps included in the first edition of this atlas were drawn between 1827 and 1828 and are most likely steel plate engravings, making it among the first cartographic work to employ this technique. Each of the maps in this large and impressive atlas feature elegant engraving and an elaborate keyboard style border. Though this is hardly the first map to employ this type of border, it is possibly the earliest to use it on such a large scale. Both the choice to use steel plate engraving and the addition of the attractive keyboard boarder are evolutions of anti-forgery efforts. Copper plates, which were commonly used for printing bank notes in the early 19th century, proved largely unsuitable due to their overall fragility and the ease with which they could be duplicated. The American inventors Jacob Perkins and Asa Spencer responded to the call. Perkins discovered a process for economically softening and engraving steel plates while Spencer invented an engraving lathe capable of producing complex patters repetitively - such as this keyboard border. Though Perkins and Spenser did not win the prize, their steel plate engraving technique was quickly adopted by map publishers in England, who immediately recognized its value. Among early steel plate cartographic productions, this atlas, published in 1830 by Longman Rees, Orme, Brown & Green stands out as perhaps the finest. This map was issued by Sidney Hall and published by Longman Rees, Orme, Brown & Green of Paternoster Row, London, in the 1835 edition of the Sidney Hall New General Atlas. Size: Printed area measures 17 inches high by 21 inches wide. Minor wear along original centerfold. If your address is a P. DHL International EXPRESS (45 USD). We can use your Federal Express Account. Duty varies by country and we cannot predict the amount you will be charged. Some countries are duty free, others are not. Additional Services Conservation Framing Services: Geographicus recommends basic conservation framing services for any antique paper. We do not offer this service. Antique Map Restoration Services: Geographicus can repair and restore your antique map. Services include deacidification cleaning flattening and backing. 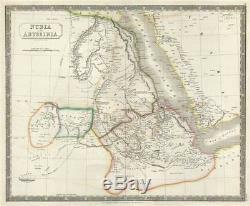 The item "1835 Hall Map of Nubia and Abyssinia (Sudan and Ethiopia)" is in sale since Thursday, September 20, 2018. This item is in the category "Antiques\Maps, Atlases & Globes\Africa Maps". The seller is "geographicusmaps" and is located in 11221. This item can be shipped worldwide.